Steal a legendary hammer of the gods. Gain entry to the Dwemer Museum in Markarth. Once you've installed the Stendarr's Hammer Creation, you will receive this quest and be directed to the Dwemer Museum in Markarth to steal Stendarr's Hammer. Note that without a key and Calcelmo's permission, entry to the Museum is illegal and the guards inside will attempt to arrest you. See the Hard Answers quest walkthrough for more information on gaining entrance. Alternatively, you can simply pick the lock and sneak past the guards. Despite what the quest says, picking up Stendarr's Hammer does not count as theft. However, it is exceedingly heavy (100 weight), so make sure you will not be over encumbered when picking it up. 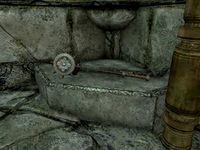 100 Rumor has it that Stendarr's Hammer has been found deep under Markarth. They say it is in the Dwarven Museum there. 1000 Finishes quest I have successfully stolen Stendarr's Hammer from the Dwarven Museum in Markarth. On the PC, it is possible to use the console to advance through the quest by entering setstage ccBGSSSE006_Quest stage, where stage is the number of the stage you wish to complete. It is not possible to un-complete (i.e. go back) quest stages, but it is possible to clear all stages of the quest using resetquest ccBGSSSE006_Quest. This page was last modified on 7 April 2018, at 08:29.